Released this week for Android and iOS, Teeny Titans combines Cartoon Networks’ second-best Teen Titans show with the collect-and-battle mechanics of Pokemon to create something wonderful. A new toy sensation is sweeping Teen Titans Go’s animated nation. Heroes, villains, talking dogs and random annoying children are buying up Teeny Titans action figures and pitting them against each other in RPG-style battles. Teen Titans leader Robin thinks the whole thing is ridiculous, at least until he sees a toy made in his own likeness. Then it’s on. He is to become the very best, like no one before him has been. 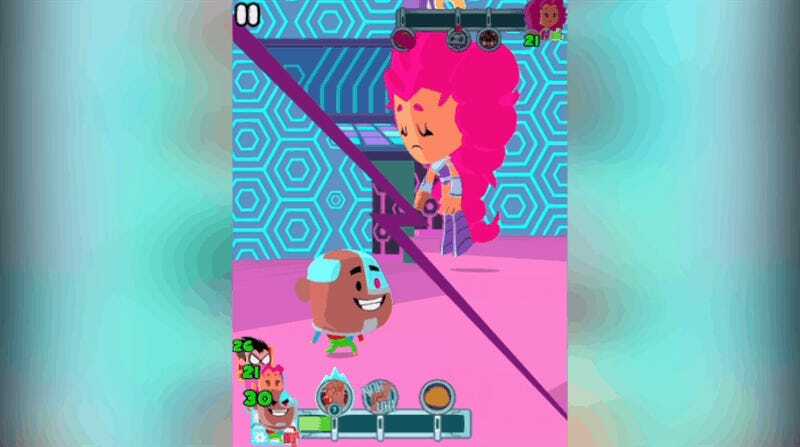 Developed by Grumpyface Studios, the team behind Stephen Universe: Attack the Light, Powerpuff Girls Flipped Out and several of Cartoon Networks better licensed mobile offerings, Teeny Titans is a Pokemon-style RPG set in the Teen Titans Go universe. Robin travels around town completing quests and engaging in battles against friends, goes and acquaintances alike. His goal is to collect all 70 Teeny Titans figures and defeat the Hooded Hood, who may or may not wear a hood. I am quite proud of my George Washington. There’s a very Pokemon vibe running through Teeny Titans, but calling it a parody or spoof sells the game short. The game’s battles are much more dynamic and exciting than those in Nintendo’s series. Rather than take turns, both players have a meter that constantly fills. The Teeny Titans’ powers are assigned slots along this meter, with more powerful abilities requiring more charge to activate. Buffs are shared by the whole team, so if Robin activates a skill that adds extra attack power, all three characters on the team get it as well. So if you’ve got a character that’s strong against Robin’s Kung-Fu, activate his buffs and then switch to character strong against your opponent to utilize them. There are powers that affect the speed the meter fills, powers that replace your opponent’s skills with waffles, powers that wipe effects on the board and powers that require additional charging once activated, giving opponents a chance to interrupt. There’s a lot of strategy to employ here, and having the team with the highest level doesn’t always ensure a win. So it’s up to the player to build a diverse collection of heroes and villains, using money earned through quests and battles to purchase figures at various toy shops scattered about the city. This doesn’t trigger my toy collector instincts at all, nope. The best thing about Teeny Titans, aside from the battle mechanics, art style, humor and polish, is that it’s a premium title. Most mobile games that involve collecting characters opt to allow players to purchase chances at scoring rare figures or buy in-game currency using real cash. Teeny Titans costs $3.99, and that’s it. If you need in-game money, you’re going to have to earn it. You gotta work for that Batgirl. Teeny Titans is now available for purchase on iTunes, Android and Amazon devices. It is so good. I only hope that we’ll see more of it in future updates, because 70 is not enough ‘em all to catch.